I am in the same position. I love things like Clannad, those anime made by Key. I absolutely hate it when I hear “I heard you watch anime, isn’t DEATH NOTE (or other average anime from Adult Swim) AWESOME!!?!?~? !”, but when I say “Sure, sure, but what about that Genshiken/NHK ni Youkoso/something else that is great?” I get no response. I know, so many great things, but they won’t watch any of them. But it out of all the low key Anime I watched, my favorite is FMA:B regardless of its popularity. I am a true fan of FMA and FMAB and I know this because Ihave broadened my shows. In fact, I never watch Adult Swim. It’s because of Netflix I even got into anime. So just because of that, you hate it? Big deal if FMA got a higher rating than Clannad or whatever. You really shouldn’t go around hating around because of some quote that Edward says. Its a catchphrase duh! It was meant to say over 100 times or what flipping number you think. 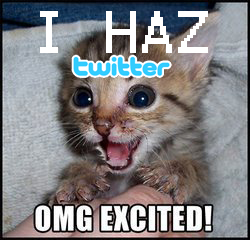 But seriously…dont rant to the world about it. @AnimeOtaku: Have people never spoiled anything for you? It happens. A lot of shows, characters, and ships (pairings) have been ruined for me. You ever heard of Homestuck? I love it. And the characters Dirk Strider and Jake English. I hate them. I hate the pairing Dirk/Jake. Why? IT’S POPULAR. When something is popular, it gets BORING and ANNOYING. It’s easy to say “You can’t hate something because it’s popular!” However, there is a lot of logic behind hating something because it’s popular. People have a right to hate things, and they have a right to hate something because of other people. I think FMA is a poorly made anime. Just because it’s “classic” doesn’t mean it’s good. I hate it because of that and I hate it because of my overly-obsessed friend who keeps bugging me to watch it even though I have. I didn’t like it. It’s a simple as that. Also, people have a right to rant. If you don’t want to read said rant, don’t. Your opinion is that you like FMA. Great! Go praise it! But when people like something, other people may hate it. They have as much a right to say hateful things (as long as they don’t hurt anyone doing so) as you have a right to say nice things. Since your comment was posted here a year ago, you will definitely not see my lovely little rant here. However, I feel like making a point. Dude…. I don’t even… I am an experienced anime watcher, and I can honestly say that I love FMA, and Clannad both, okay? I’ve seen way too many anime to count and have read a lot of manga. It is incredibly immature to announce you hate an anime simply because other people like it so much. Even if that is the case, there’s no reason to put up on a website for the world to see. Okay, yeah, I can kind of understand this kind of post for something that’s not worth the time. 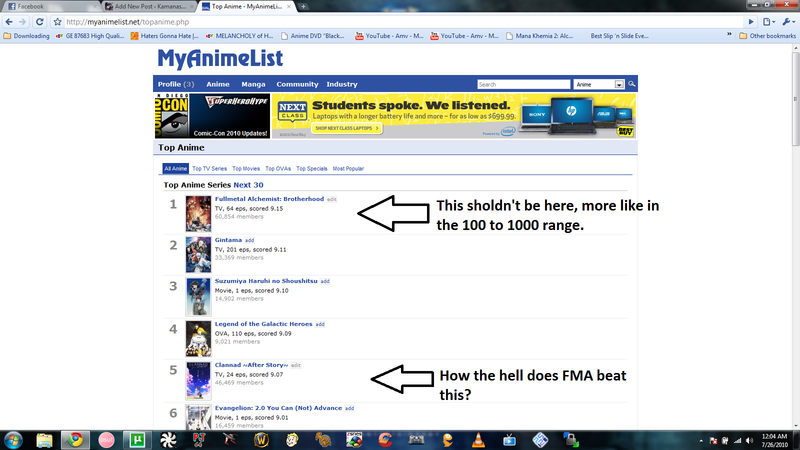 For example, SAO, who even non-anime fans have heard about by now despite how… Mediocre it was, but FMA? Not to mention, why are you comparing FMA with Clannad in the first place? They’re in completely different genres besides maybe romance elements. I don’t know why you lost your love for FMA, but there’s no reason to hate on it. I mean, why start a fight over two things that are better than the average anime for such a stupid reason? Just don’t read favorite anime polls then! Sheesh. So immature. I had a huge rant for you but my internet refreshed. Whatever, it’s probably for the best anyways. I’ll sum it up. You’re being immature. There’s no need to rant about such a stupid thing. Just don’t read the flipping favorite anime polls then! Just because something is popular, doesn’t mean you need to hate it. I’ll use a more modern example: Everybody and their brother loves SAO right now. I don’t. Why? Not because it’s popular. It’s simply an average show that doesn’t deserve the attention. It’s a show that is used just to pass time. If something is going to be popular (like FMA) it should try a little harder to deserve it. Or else, we should just keep what’s popular, popular: Clannad:AS, FMA, etc. Also, something to say read quick. It’s pretty obvious why FMA is beating Clannad in the polls. I can say this objectively, FMA has a wider projected audience: it has battle scenes and blood for guys, romantic scenes for girls, and a lot of scenes the entire family can enjoy. While Clannad, not saying it isn’t good, has a more female intended audience because guys don’t usually go for all that mushy stuff. Oops I ended up typing a lot anyways. I like them both anyways, and I find there’s no need to fight over such trivial matters when Otakus are Otakus in the end and we should all try to get along, ‘Kay?